The Alaska Fine Arts Academy is taking a sabbatical to regroup and to focus on where their next step will be, but before they do, they are teaming up with Cyrano’s Theatre Company for one last theatrical blast, and what a blast it is–Dennis T. Ginacino’s Disenchanted! a musical of “royal renegades” (Rapunzel, Cinderella, Little Mermaid, Sleeping Beauty, et.al.) who “toss off their tiaras” to tell it like it really is. 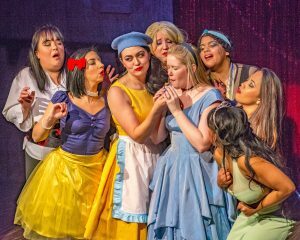 Two of these “princesses”, “Snow White” (Anna Cometa) and “Pocahontas” (Lailani Cook) join director Warren Weinstein today on Stage Talk to tell some of their secrets… Disenchanted! performs at Cyrano’s Theatre Company January 26 through February 11. ORIGINAL BROADCAST: Friday, January 26 at 2:45 p.m.